Beyond the music, our super-secret goal is to help develop well-rounded, respectful and creative human beings who understand the importance of leadership and responsibility. Our Alumni found their passion inside the walls of our building and have continued to live that passion every single day since. Our Alumni are an important part of who we are, who we have been, and who we will be. 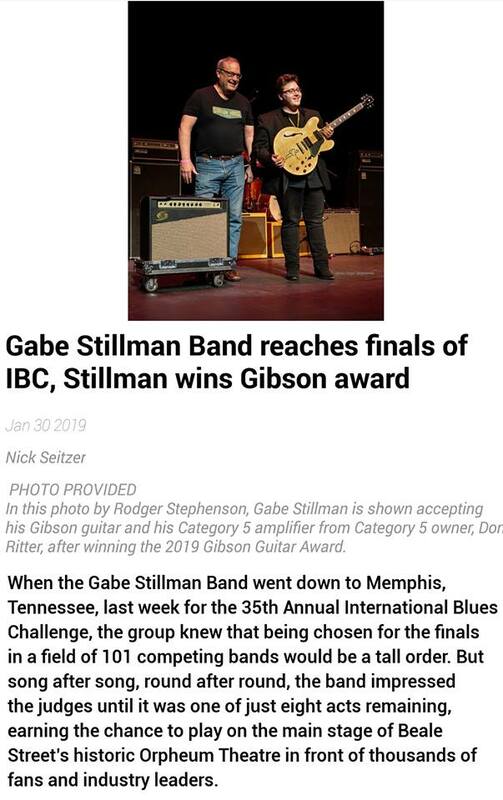 Be sure to check out today’s (1/31/2019) Williamsport Sun-Gazette showcase re-capping The Gabe Stillman Band’s whirlwind trip to the IBC in Memphis, Tn last week. They represented the Billtown Blues Association, and Gabe received the prestigious Gibson Guitar Award at the IBC Finals!! Gabe is not only an alumnus of the Uptown Music Collective, but is also an instructor! His band is also made up of UMC family members including current drum instructor, Jesse Roedts, and UMC alumnus and former bass instructor, Colin Beatty!